Simpson set to run down contract? | NUFC Blog. 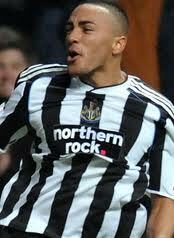 Right-back Danny Simpson will refuse to sign a new contract at Newcastle United according to rumours in the Sunday Sun. The Sunday Sun (bless its heart) is reporting that contract negotiations have broken down between Danny Simpson and the club. The Sun alleges that the club have offered Simpson a 5-year contract and aren’t prepared to budge from their offer, but the offer is too low to interest Simpson and he will therefore not be signing it. The Sun does not quote any sources of their information, it merely ‘understands’ that the situation is thus and they further suggest that Simpson will just run down his contract and leave at the end of it unless he is sold in the interim. “He’s got a future here but he’s got a fight on his hands because Ryan Taylor has done terrific at left-back and now we’ve got Santon who can play both positions. So he needs to play well now. Hmm, well forgive me if I doubt you Alan. To be fair we don’t actually know what’s going on but it would explain why Simpson hasn’t yet signed a new contract and why rumours were floating around about us being interested in a right-back recently. No doubt this will be part of the club’s policy to only pay players what they consider to be a ‘fair wage’, which is fine in principle but it assumes that the club’s idea of fair wage is at least based partly on what the market also calls a fair wage. Otherwise we’d have a situation where just about anyone who might class as ‘experienced’ and deserving of a ‘better’ wage will be moved on because the going market rate doesn’t align with the club’s estimates of what it should be. I definitely agree that we must stop paying over the odds for so-called ‘marquee’ signings that are past their best and spend most of the time on a sick note, but I think that must be tempered with a willingness to pay for genuine quality that benefits the club both in terms of ability and experience. I would hope the club doesn’t have blanket upper limits on the wages and transfer fees they’re prepared to pay and that each player is evaluated on their own merits against a reasonable assessment of what constitutes market value. If this Simpson stuff is true, it doesn’t bode well for the long-term NUFC future for Fabricio Coloccini either. I’m sure he must be one of our highest wage earners and his contract is up round about the same time as Simpson’s. Danny Simpson rubbishes contract speculation after fan abuse. Pardew: We need more sponsorship to keep best players. Colo will recieve new contract but 30-40k wage drop and only 2-3 years long. Will he sign it ? No. And DL come to say he want to leave again. I have no idea what Simpson earns and therefore cannot measure him against other premiership right backs but I can conpare him with others based on ability and to me he definately is not in the top 10 unlike Enrique who was for left backs. Enrique knew he was admired by other clubs and was fairly certain he could command a higher salary but this cannot be the case with Simpson. I don’t see any Liverpools coming in for him anytime soon. He is taking a hell of a gamble by not signing his new contract, although it is his choice. Given what Enrique did, I doubt the club will hang about waiting for him to make a decision. They have Raylor, Santon and Tavernier. BTW, has anyone seen the Newcastle United club website and the first team members as it now includes Peter Ramage ! On a theme of “getting things right” how current is the Physio room injury list ? I ask becos its still saying 6 weeks for HBA ? Define “negotitions have broken down”, just because an agreement hasn’t been reached it doesn’t necessarily mean a worst case scenario, the press love to wind up the ante though. Andy/Hugh, HBA is starting to look like he has Owen syndrome as does Kadar and Vucik, are we ever going to get a consecutive run of games from them, bl**dy irritating innit. vucikc has a broken hand, so hopefully not an injury that persisted – since his trouble last season, he seems to be a big enough and strong enough lad to move on now (i hope). *a wide open window i hope, even a French sliding door. Bloody footballers and their textlanguage! Didn’t he just do an interview recently stating he was looking forward to the comp for a place on the pitch now Santon had joined? It’s always interesting/funny/pathetic how different rags/sites/media outlets ‘read’ & they ‘write up’ a ‘news story’. Sometimes it’s diametrically opposed ‘takes’ on the same ‘quotes’. A little competition would be good for Simpson. Will it turn him into one of the best right backs in the league? I doubt it very much, but it may at least keep him focused and cut out silly mistakes. As far as Coloccini is concerned, I’m afraid we will be losing our captain two summer windows in a row. they are building tavernier as a perminent rightback…may be in a season or so he should be ready,also ferguson,these two lads should head out on loan .hopefully we can find a championship place,. but lg 1 or 2 would be great.does any one think sammy would benefit a loan spell?